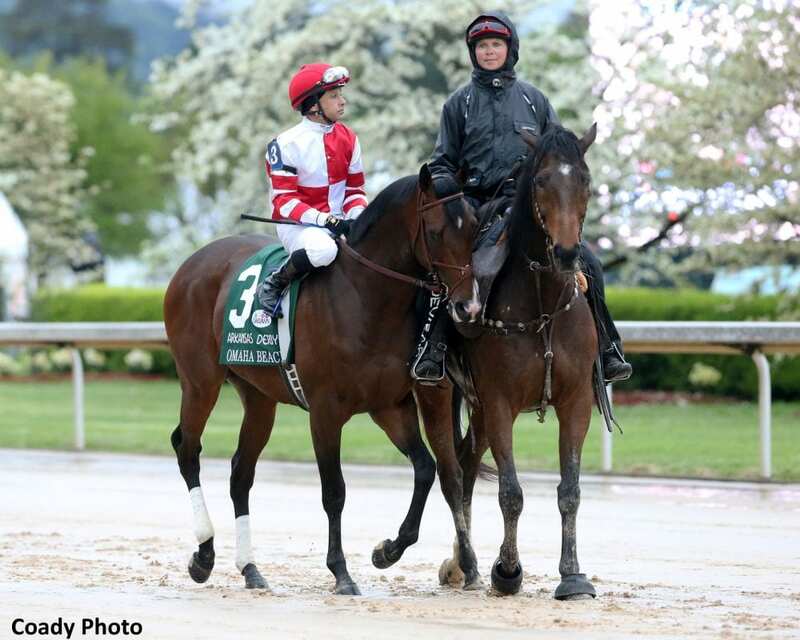 Six Oaklawn-raced horses have enough points to run in the Kentucky Derby, including Omaha Beach and Improbable, the top two finishers in Saturday's $1 million Arkansas Derby (G1). Omaha Beach exited his one-length victory in good order, Hall of Fame trainer Richard Mandella said Sunday morning, adding the War Front colt, owned by Rick Porter's Fox Hill Farm, will probably be vanned Tuesday to Churchill Downs to begin preparations for the May 4 Run for the Roses. The Arkansas Derby represented the third consecutive victory for the rapidly improving Omaha Beach, who has found a home on dirt after losing his first three career starts on turf. Omaha Beach broke his maiden by nine lengths Feb. 2 at Santa Anita, then won the second division of the $750,000 Rebel Stakes (G2) March 16 by a nose over Game Winner, Hall of Fame trainer Bob Baffert's previously unbeaten 2-year-old champion. Before an estimated crowd of 45,000, Omaha Beach ($5.40) was the slight 8-5 favorite over Improbable (9-5). Ridden by Hall of Fame jockey Mike Smith, Omaha Beach ran 1 1/8 miles over a sloppy track in 1:49.91, slightly faster than Quip's winning time in the $750,000 Oaklawn Handicap (G2) for older horses about 90 minutes earlier. Omaha Beach carried equal top weight of 122 pounds. According to Churchill Downs' official Kentucky Derby points rankings, Omaha Beach ranks second with 137.5. The Kentucky Derby is limited to 20 starters. If the race overfills, starting preference is given to horses with the highest point totals in designated races like the Arkansas Derby. Mandella, 68, is seeking his first Kentucky Derby victory. His best finish with six starters to date, Soul of the Matter, was fifth in 1994. Conversely, Baffert, Mandella's Santa Anita neighbor, has won the Kentucky Derby five times, the last two with eventual Triple Crown winners American Pharoah (2015) and Justify (2018). Baffert, Mandella kidded, had been giving lessons on how to win the Kentucky Derby – until roughly 10 weeks ago. Three Arkansas Derby winners have captured the Kentucky Derby – Sunny's Halo (1983), Smarty Jones (2004) and American Pharoah (2015). All three also won the Rebel. Baffert said immediately following the Arkansas Derby that Improbable would be pointed for the Kentucky Derby. After finishing second in the first division of the Rebel – the City Zip colt's first career loss – Improbable was wound up in the Arkansas Derby post parade and antsy in the starting gate, having to be backed out after initially loading into stall 1. He still finished a strong second (it was 5 ¾ lengths back to third-place finisher Country House). Improbable raced in blinkers for the first time Saturday after losing a little focus in the Rebel, Baffert said. The equipment change, Baffert said, didn't help. Hall of Fame trainer Bill Mott said Sunday morning that he was pleased with Country House's performance after the late-running Lookin At Lucky colt was wheeled back in three weeks following a fourth-place finish in the $1 million Louisiana Derby (G2) March 23 at Fair Grounds. Long Range Toddy beat Improbable by a neck to win the first division of the Rebel for Hall of Fame trainer Steve Asmussen. Long Range Toddy ran sixth in the Arkansas Derby. Cutting Humor finished seventh as the favorite in the $500,000 Southwest Stakes (G3) Feb. 18 for trainer Todd Pletcher. Sueno was runner-up in the Southwest, Oaklawn's second of four Kentucky Derby points races. Sueno is trained by Keith Desormeaux. This entry was posted in NL Article, Triple Crown and tagged arkansas derby, bill mott, Bob Baffert, churchill downs, country house, Horse Racing, improbable, kentucky derby, Oaklawn, oaklawn park, omaha beach, richard mandella, rick porter, Triple Crown, war front by Press Release. Bookmark the permalink.